Transparency international Zambia is disappointed with President Edgar Lungu’s inability to act decisively against corrupt elements in his government. The organization is particularly disappointed that he has refuse to relieve Housing and Infrastructure Development Minister Ronald Chitotela of his duties even after the Anti-Corruption Commission found enough evidence after their investigations for them to effect an arrest on the sitting cabinet minister. Transparency International Zambia President Reuben Lifuka recently requested President Lungu to relieve Mr. Chitotela of his duties so that the due process of the law can take its course without any interference from his office. TIZ Executive Director Wesley Chibamba says his Organisation now wonders how this is going to appear when Mr. Chitotela is going to answer corruption charges driving a government ministerial vehicle flying a Zambian flag. “We think our Ministers and leaders in general need to have a moral cautious. The allegations against Mr. Chitotela are quiet humongous and some of them are pointing to the fact that there could be state house involvement and President Lungu’s refusal to fire him really fires up that kind of speculation because unless he is hiding something, we would have expected him to demonstrate his resolve to fight corruption by beginning to let go of those elements in his rank and file that are deemed to be corrupt”, he said. Mr. Chibamba said the ACC does not just effect an arrest, they go through a thorough investigative process and when they find evidence to the effect that this person is corrupt and they can produce this evidence in court, that is when they effect an arrest. He said ACC does not just arrest people from without but with evidence on hand. 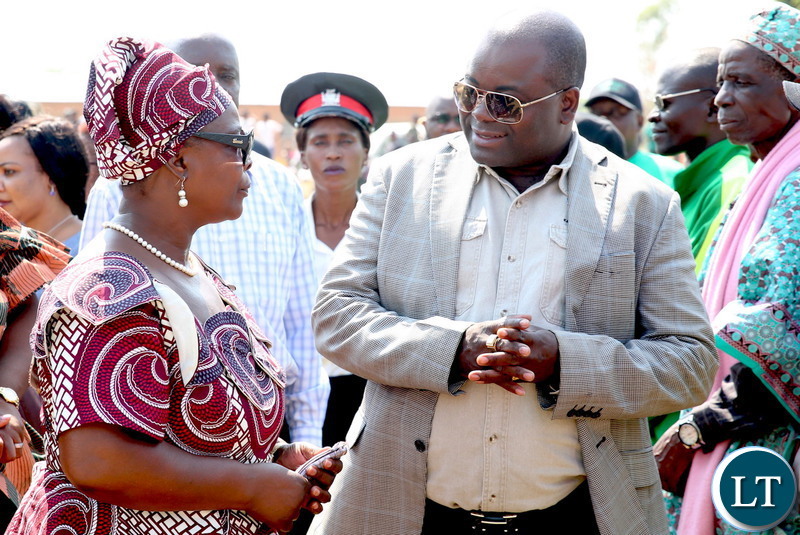 “What President Lungu has demonstrated today is that he does not mind having corrupt elements in his government, he does not abhor corruption which we think is a direct contradiction to his pronouncement on the 9th of December 2018 when he came to officiate at the International Day Against Corruption”, Mr. Chibamba added. Mr. Chibamba has since requested President Lungu to do the honourable thing and relieve Mr. Chitotela of his duties, unless there is something that they are hiding that they do not want the Zambia people to know. A person remains innocent until proven guilty, as at now Mr. Chitotela is innocent. He is just a suspect. Wait until he is proven guilty. If the president had to defend him Mr. Chitotela was not going to be arrested. Let’s give time for the court to find him guilty. Why are you panicking to have him fired, if he is fired now it will mean that Mr. Chitotela is guilty without due process. We are all interested in these cases of corruption. And it’s there are main more ministers who are about to be arrested. The reason people are suspended is to allow for smooth and independent exhaustion of investigations. If chitotela is allowed to continue the danger is that not only would he impede the investigation but also interfere with witnesses and evidence its that simple! Yes he may be innocent so let him step aside and prove it! Your logic falls apart when you look at precedence to matters such as this. Point in case is Kambwili Vs Lungu. Kambwili got fired, but has never seen a day in court for the reasons he was fired. He has been in court for petty fraud yes, a case brought against him by PF proxy agent Tayali. No minister will ever spend time in jail while Lungu is still in power. They all know too much, and will spill the beans to save their own skins. They have been eating from the same pot as Lungu. Lungu never fires anyone for being corrupt. He only fires those that exhibit presidential ambitions. Transparent International should not forget that corruption is a norm in PF and that term does not exist in their dictionary. Stealing is permitted provided you do not steal everything. “Kulya kuti mwalya, lelo mwilya kumo nembuto (Lungu,2018). Time to eat is now (Jean , 2018). Blessings to steal and engage in corruption come from the top so the president can answer like that while RB is fooling us that the economy is good when he means his pocket. Even Hon Kabanshi was just a suspect. Kabanshi was not fired for corruption, I will not stop cleaning up her name. Chitotela should do the honourable thing by resigning. Being an SDA elder, Chitotela cannot go for Sabbath without resigning first. Not sure if he’s been found guilty yet coz due process is important, but even the mere appearance of impropriety /corruption is enough to make one resign. Our Government is week on corruption fighting direction, we are just pretending.Honestly, there so many who been fired/ suspended on similar vices. In this case, that chitotela is above the law. So you can refuse to be investigated?! Zambians plz follow these issues with analytical skills. If the president supports Chitotela as imagined by some people. Chitotela will not be arrested. The president has simply challenged the ACC and the courts to speed corruption cases. He pointed at CK’s case were ACC claimed they had evidence but its now amost 3 years, ACC and the courts can not prove their speculations on CK. You are wrong. ECL was using the ACC to finish of Kambwili and not the other way round. Be smart in your analysis. When a leader uses Governance institutions to fight political battles the result is what you get with CK though his cases are still in court. He has not been acquitted yet despite ECL wrongly and frustratingly exonerating him publicly. Tells you that his interest was to see the man dealt with by ACC for ECL’s political reasons. Napela. As Chitotela, no one has said he must be jailed before proven guilty but that is the moral and logic thing him to resign or the president to suspend him till his cases are concluded. As things stand now for Chitotela, it is a national insult and embarrassment. The country will never be governed through lies, market talks and jealous gone are the days of KK who used to fire MCCs on gossip from the streets. Zambia is a free democratic country with laws, you can say all what you what but no one is above the law hence I agree with the President. ….continued…. THE QUESTION OF CHITOTELA RESIGNING ON MORAL GROUNDS IS PERSONAL AND SHOULD BE LEFT TO CHITOTELA TO DECIDE. I PERSONALLY WOULD’NT WANT TO BE FIRED ON MERE SUSPICIONS. The problem with Zambians is that they are always busy begging leaders to do what they feel is right but without strengthening institutions. Let us strengthen institutions and make laws clear in dealing with these things and we will stop begging leaders to do the right thing. A Man is innocent until proven guilty. Even God allows the good and the wicked to live out their lives free of judgment until the great day of judgment. Let’s not be a culture that celebrates finger pointing and accusations without due process. I admire the Presidents level headed stance on this. Investigate, prosecute, lock up or acquit, that is the Law. No he hasn’t, he has just exposed those that were seeking a persons downfall prematurely by allowing justice to prevail. He Presidents stance will embolden investigative wings to pursue anyone regardless of status knowing the president will not interfere. Let’s not try people on Social media. All of us have skeletons we hide, they are just not exposed. Transparency International is a toxic by product of the colonial era, busy showcasing African shortcomings but afraid to hold to account US and British officials that caused the death of more than two million people in a false war in Iraq. They are silent on Britain selling arms to Saudi Arabia that have been used on a weaker country Yemen and caused the words biggest humanitarian crisis? How can this organization now claim that due process in the law demanded by the president is wrong? We should deregister such organizations from serving in zambia they are just agents of regime change. TIZ, please Google this UK MP case and note constitutional matters not emotive outputs. Chitotela is innocent and free until found guilty. ( Check this case; quoting Guardian Newspaper, ‘Fiona Onasanya’s car was doing 41mph in a 30mph zone. Comment: The fact that Hon chitotela has been charged, is enough to have him droped. The case is already investigate and evidence is there linking the minister to crime. The next step is for the court to determine if the prosecution can prove the case beyond any reasonable doubt. Court cases usually takes long to be concluded. so allowing him to continue working as a minister while attending court cases is very dangerous for the country. Even in his work envirnment, he will be regarded as a criminal and will not be respected. Why having double standard. If Hon Chitotela was a civil servant, he could have being suspended without debate. Our president should tell us the truth insteady of making comparisons with Kambwili. This issue’s further evidence of the weakness of our constitution. It would seem there’s no constitutional position on this issue, for the President to ignore such a serious charge on cabinet member. Then again he ignored the constitution before the general election and there was no recourse for citizens, even when the courts ruled in favour. We need to completely revise the constitution because whoever becomes president next time will act with same impunity. Please let’s focus on the disease. Wesley Chibamba says his Organisation now wonders how this is going to appear when Mr. Chitotela is going to answer corruption charges driving a government ministerial vehicle flying a Zambian flag. The answer is simple: thats how corrupt the whole government system is. And by flying that flag high whilst going for those hearings just shows how proud we are as a nation to keep corrupt ministers in government. The message is bazaziba bwanji that we are corrupt and the whole government is corrupt. How I wish those ministers who claim not to be corrupt can remove flags from their vehicles otherwise we shall not see the difference now. For me those flags on ministers’ vehicles is a now a symbol of corruption. This is the worst government one can ever dream of even in one’s wildest dreams.